It is fair to say that the Eames Fiberglass Arm Chairs are one of, if not the most, popular Eames design in existence. But not all of these chairs were made equally! It is easy to get confused sometimes with the sheer number of colors or bases or with ages. You may have heard or read enthusiasts or collectors speak about first generation, second generation and not know what any of it means! Generations are of course subjective in any case but by using such a system really does help to recognize, authenticate and age a chair reasonably accurately. 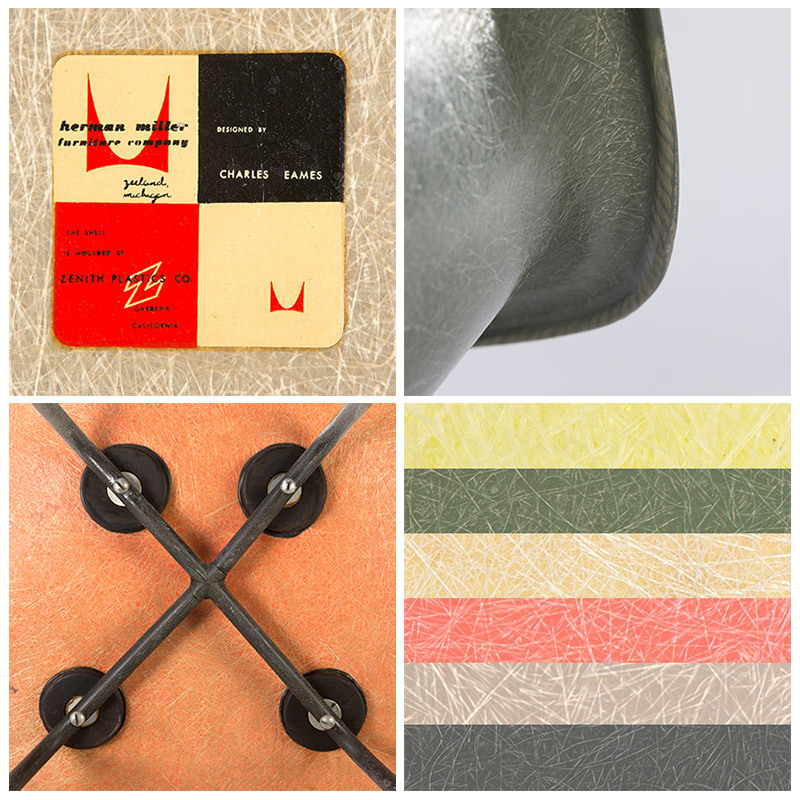 From humble beginnings in the original Eames Office, to the first factory of Zenith Plastics, and to the last in Zeeland Michigan, the Fiberglass Arm Shells will always remain our favorites. 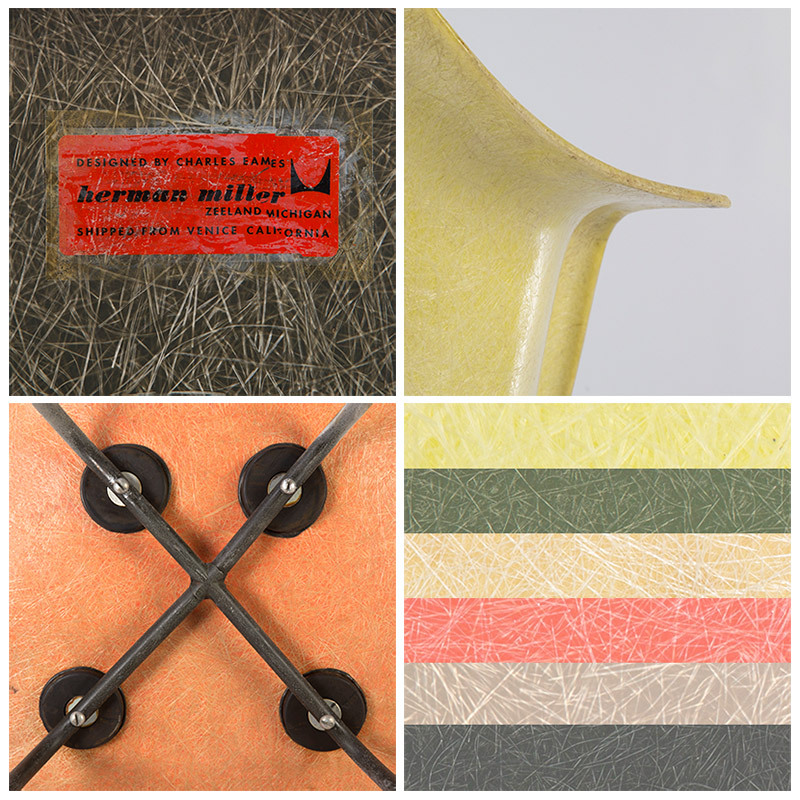 In this article, we explore the many Eames Fiberglass Plastic Arm Chair Generations. First generation arm shell was produced at the Zenith Plastics factory in Gardena, California. They were available initially in 3 colors with 3 more being added after the first run. Sometimes referred to as Generation 1.5 are fiberglass arm chairs sporting the 'Half Checkerboard Label'. The Label was only used for an estimated 5 to 6 months and ran from the end of the Checkerboard Label from 1953 to 1954. Although the label had changed, the chair itself was identical and undoubtedly still 1st generation. The label was to signify Herman Miller's increased role and Zenith's less so. 2nd generation arms are made in two locations. Some are still made at the Zenith factory in Gardena, CA and manufacturing is also taking place at the Eames Office in Santa Monica which have red Venice Label. 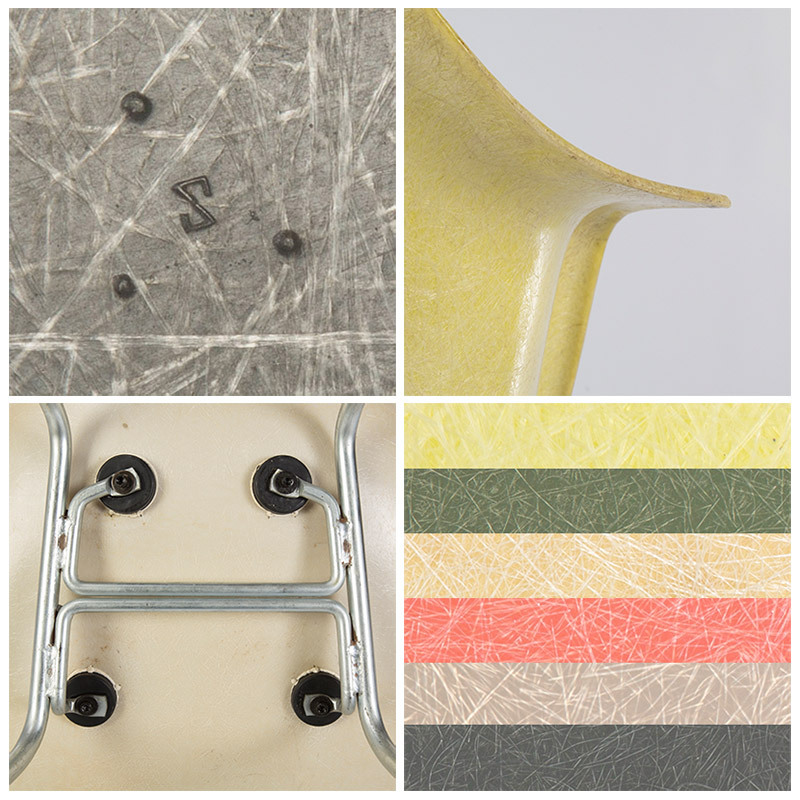 The first 6 Fiberglass Arm Chair colors ran for an entire decade from 1950 until 1960 and remain today as some of the popular colors ever to grace an Eames Chair. These first colors were chosen by Charles & Ray Eames personally, through much process, but few can argue the right balance was ultimately made. The third generation Arm shells have 3 raise dots (sometimes hard to see) some with backwards Z, some without. 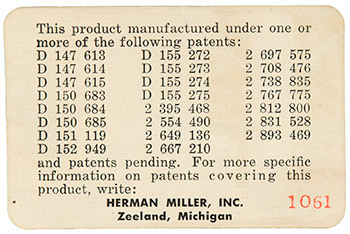 Patent Labels were introduced from 1957 (first appearing on the 3 dot Arm Shells) and beyond, right up until fiberglass chairs were discontinued in 1989. Whereas at first glance they may appear to be nothing more than technical numbers, a little research and study can tell you every thing you need to know about ageing your shell. 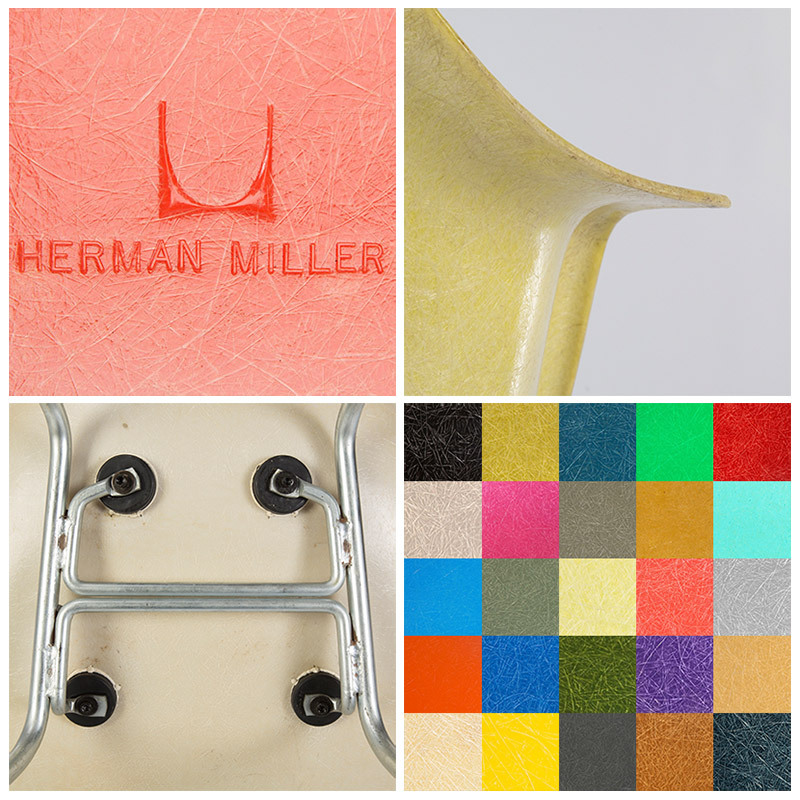 4th gen shells were made at multiple factories and with many differing shell colors, all with Herman Miller Embossed. But what of the Eames Plastic Arm Chairs, available since 2001 we hear you say?... well we barely consider them to be an Eames Chair at all but it is only our opinion. Whereas on the one hand they match the original Eames Ethos as 'low cost furniture for the masses' it appears to apply more to the cost of making it rather than those buying. When you consider tops made from polypropylene are machine mass produced and cost around $5 in factories dotted around China, yet sold for hundreds of dollars one could ask; where is the quality? Also worth considering is their launch 13 years after Ray Eames' death (23 after Charles) it is certainly fair to say neither had any involvement in their being whatsoever, despite the insinuation that they did. 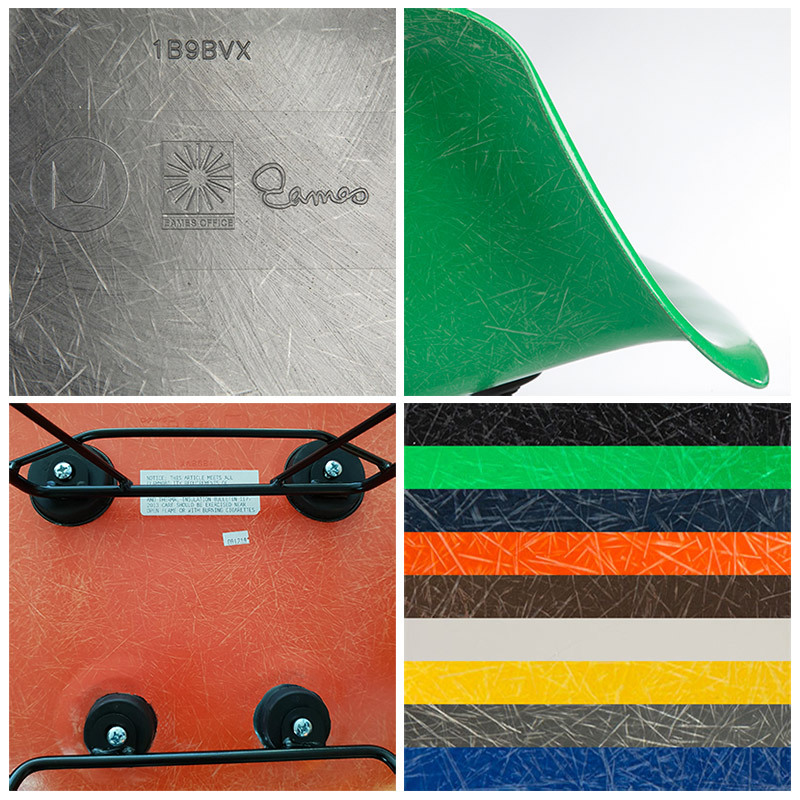 After a 24 year absence Eames Fiberglass Shells are back since 2013, made by HM in Zeeland, MI.